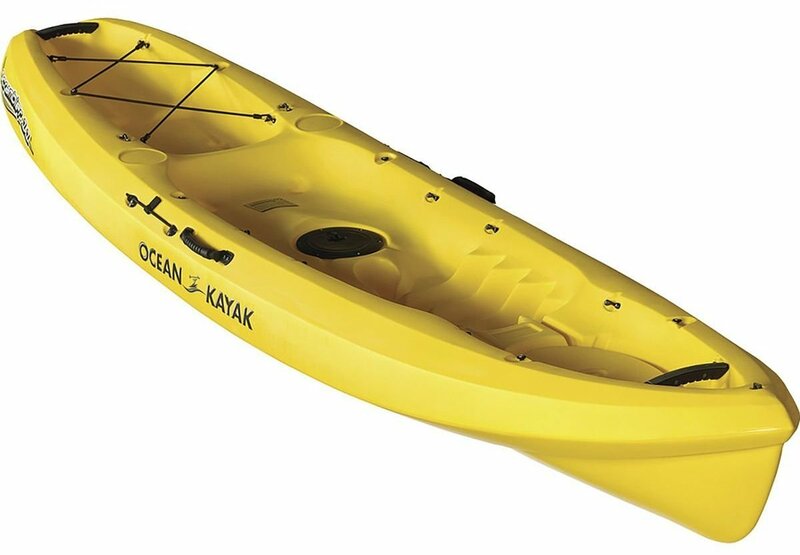 The Ocean Kayak has been renowned for their quality inventions in the fishing kayaks world. Their quality kayaks understand what every angler wants in their kayak for angling. On the other hand their kayaks use high quality materials for the ultimate strength and stability. And in truth this Ocean Kayak Scrambler 11 is not different from their other creations and it has been created with multiple ample storage compartments, high quality cushioned adjustable seats and foot braces. So you would have an amazing day of fishing with getting the snacks, foods and fishing gears in your very near. If you even like cruising or watery shenanigan with your kids, then this high capacity and stable kayak also can give you some very enjoyable moments. It can track amazingly well on the flat water and give the paddler an excellent paddling time to navigate the areas. Furthermore, the hull of it is specifically designed to maneuver the kayak easily on the ocean swells and surf. So you can make successful the fishing expedition on any fishing spots as the kayak suits with any condition of the water. 1 What Are The Specifications Of It? What Are The Specifications Of It? The kayak has some remarkable specifications and I think this would be one of the best fishing kayak. So let’s find what are those specifications! Stability, capacity and balance define the quality of the kayak. This strength kayak is made of roto molded polyethylene plastic with perfectly designed Tri-foam hull that give the outstanding stability and good balance when you pedal the kayak on the ocean swells and surf. The tri foam hull also made the kayak speedy with easy maneuvering while the 300-350 lbs weight capacity ensures that it completely able to take the weight of you and your all necessary gears. So you can confidently take it anywhere for fishing expeditions. You obviously have to carry many items for angling and that’s why this Ocean Kayak Scrambler 11 has been featured with a large dry storage compartment with 6” cam lock hatch, deck bungees and a tank with bungee. So you can securely store the gears like fishing reels, cooler bag, lures, hooks and all necessary items you need to store. It has also a molded in cup holder where you can safely put the drinks to keep you fresh. The comfortability of a kayak prolongs the fishing time and that’s why to give an optimal comfort for the whole day it features a Comfort Plus Seat Back that is extremely cushioned and has 4 way adjustability. So the seat can be fitted with any type of body to give the optimal cushioning. Furthermore, the kayak has ergonomic foot wells as if you can find the most comfortable seating position with your leg length. The kayak can simply hold some water when you are fishing or cruising, so if the kayak hasn’t proper drainage system, then these excess water can mess the kayak’s floor. That’s why the kayak has threaded hull drain plug that you can use to drain out the water to keep the kayak’s floor dry. Excellently stable with great capacity. Stiff and made of high quality materials. Multiple storage compartments with wide space. Wide deck for extra balance. Comfort Plus Seat Back For Extra Comfortability. Foot wells for the optimal comfort. People love quality and if you want to get the quality, of course you have to spend some additional bucks for your desired product. This Ocean Kayak Scrambler 11 is something like that, but end of the day you will be amazingly satisfied for its optimal service on kayak fishing, cruising and other kayaking sports. FeelFree Lure 11.5 Kayak: Is It Really Great for Comfortable Fishing?